Each state in India has developed its own distinctive styles, techniques, and designs, which are known by local or state names. The inspiration often comes from Hindu religion and the local flora and fauna same is the case with the Embroidery of the state of Rajasthan. Here is a look at Rajasthani embroidery and Hindu influence. In Rajasthan, each place has its own distinctive style of embroidery. A specialty of Rajasthani designs is the depiction of birds such as peacocks, and animals such as horses, camels, elephants and lions. The Jat women of Sikar and Jhunjhun embroider the motifs of birds and animals on their skirt borders, while women of the same community in Bikaner embroider their thick woolen shawls by employing double-running stitches to create patterns similar to bandhani – a popular method of imprinting multi-colored design by the know tie and dye process. The Mev tribals in Alwar employ the chain-stitch and embroider their wraps predominantly with yellow silk threads. These wraps bear resemblance to the phulkaris – floral motifs of Punjab, where the stitches and motifs, floral or geometrical, are combined with those of birds such as dancing peacocks. Women from Jaisalmer, too, wear richly embroidered garments, the motifs often interspersed with small round pieces of mirrors held into the fabric by buttonhole stitches. Embroidery is combined with appliqué. The embroideries of Nathdwara depict the image of Vishnu (Shrinathji) on the fabric by using a needle and colored silk threads. 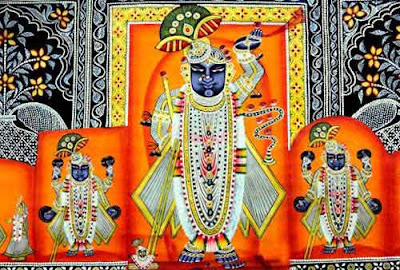 These follow the style of painted pichchwais of Shrinathji. The desert areas of India are known for their ornately embroidered leather shoes and camel saddles. Love of primary colors – red, yellow and blue – is typical of Rajasthani embroidery. Notes Taken from - Encyclopedia of Hinduism Volume IV – India Heritage Research Foundation – Page no 34.